The Gentleman Crafter: How Tags Saved My Diet! Well, I've just about decided that when I start to use my stomach as a handy dandy tool, a third hand to catch things rolling off the studio table, or the perfect shelf that holds books and laptops...then it's time for me to watch my food intake! See I didn't say diet did I? So today, I actually started my new eating lifestyle! Whatever! LOL! I've had more fruit today than I've had in a year. Tuna...I don't eat tuna! Akkkkkkk! I ate it! I never knew how totally scrumptious a single slice of whole wheat bread was! I was in heaven. By God All Mighty, I better get on that scale tomorrow and have dropped 20 pounds! Ok, I'll take two pounds! The thing that has been the hardest so far is the coffee! I drink coffee by the pots not the cups! Before the night is over I knew I was going to have to admit myself into a treatment center for coffee addiction! I miss it so much! The smell, the taste! Good Lawd, how in the world am I going to get started in the morning! Water? Really! Maybe a cold shower! I honestly will not go into how many jugs I consumed today! I wont mention how many times I hit the mens room! Tomorrow I'm just grabbing a bucket and saving myself the trip! LOL! Ok, enough about eating appropriately and enough about how I'm missing some good old chicken fried steak smothered in cream gravy with buttery mashed potatoes, home baked rolls and a big slice of Key Lime Pie!...WITH COFFEE! Bahahaha Onward to show you what has kept my mind off these basic food groups! TAGS! I'm back in the studio tonight playing with tags! Yep, that wonderful little piece of art that can be done in a single night! Got to love that huh? Of course I had to add a healthy dose of Idea-ology to it, but I love me some Idea-ology! I truly do! OMG, aren't you loving the new stuff! Amazing! I am truly going to need more space! Storage space. Well, here's to tomorrow everyone! Have a totally awesome day, night and morning! Love your story and your tag. Seems like you are off to a great and different new year. thanks as always for sharing. Thank You Theresa for always being here! You Rock! J. Well I gotta say that tag makes me want to just throw my hands up and give up. Amazing….the mustache…Please? Seriously…so cool. I adore everything about it. As for the diet- you can do it. I just lost weight when my blood sugars started creeping up. You only get one you. Hahahaha! So glad you like the tag! I thought it was fun! You made my night! Yahoo! So true! Only one you! Good advice! Too clever! Love this. Pinned it. Thanks Gail! You are a sweetheart! OOOO...scary!!! Love how you've put all this together...especially the jaunty crown. Silly boy...start the diet AFTER CHA...you are gonna NEED coffee and food to keep your strength up so you can show us everything that's cool, new and MUST have!! Barb! LOL! I'm changing my eating habits so I can get to CHA! Once there, baby bring on the Italian Food! LOL! j. That first morning coffee ...... mmmmmm! A treat to yourself, but after that, water. Good luck with your new foodstyle way of life, you'll feel better for it. And between work and craft, the hours will just wizz past. Look forward to your 2013 creativity! Thanks Helen! I need some luck! Trust me! LOL! :) J.
Jim, have I ever told you that you are awesome? Well, you are!!!! I have this stamp set so I think I am gonna put it to use. Good luck with the diet. I know how hard that can be. Good wishes from SC. First of all, your tag is AMAZING. I love the background the red is wonderful. The beard and mustache, why didn't I see them that way? I wish my brain was wired like yours. How about doing a tag a month like Tim and give us step by step instructions? Secondly, the diet, well I can't help you there. I too need to change my eating habits and lose alot. I don't drink coffee but I'm a coke-a-halic! Inspire me, too follow in your footsteps will you? I love how once your to CHA you will eat drink (coffee) and be merry!!!! That's my kind of diet. Aah! 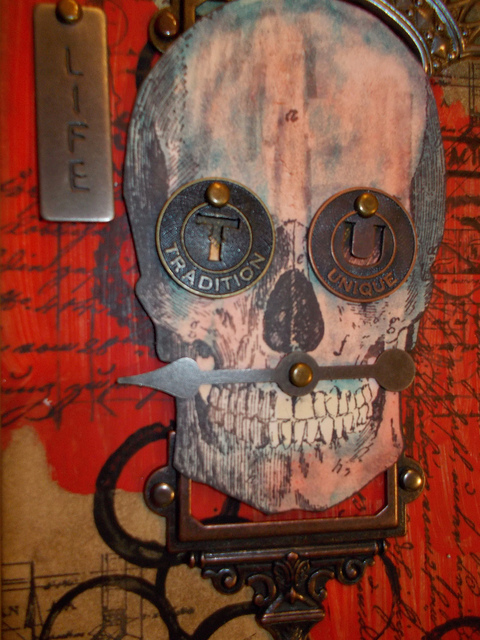 I can"t resist anything with a skull involved. Love the red and very creative Idea-ology (dang, but I have trouble spelling that word) usage. I have to admit that I bought another set of feet yesterday. Your ordeal put the fear of God into me. Let's hope all of the great new stuff shows up in the stores soon. I'm with TexasBarb - start the decreased food intake after CHA. And then allow yourself one or two small nondiet items a day.You'd think they would have a magical pill by now for weight loss.What day are you headed to LA? Have you got your laundry done? Lol. Forgot to mention - really love how you did the ribbon. I lost 16kg/35lb in 6 weeks by cutting back my intake of starch/fatty foods and only having 1 LARGE mug of coffee a day to get me going in the mornings...believe me...you don't want to know me if I haven't had my coffee...so hang in there, it can be done! Love the idea-ology on this tag and the colours. Oh Jim!!!! I am really into skulls right now. Also, you know by now I'm into you always!! Love it all!! So need that stamp, did you say where it's from? I'll scroll back in a sec. Now going to pin,.share & save to my personal inspiration place. As to eating stuff, since when was coffee fattening?? The caffeine is bad but...? I drink tea so maybe i am just ignorant. You are perfect the way you are but if it makes you happier, go for it! Success is in your blood so it won't be hard. Your tag put a smile on my face...he's super cool!! I'm gonna have to make one for my grandson...he loves skulls. Keep up the good work with the new eating lifestyle changes! Is this what you see in the mirror after only 1 day of healthy eating? You NEED coffee!!! Jim, You are so entertaining. You crack me up. I'm loving the cool hardware on your tag. Oh I've missed your posts! Nice tag. 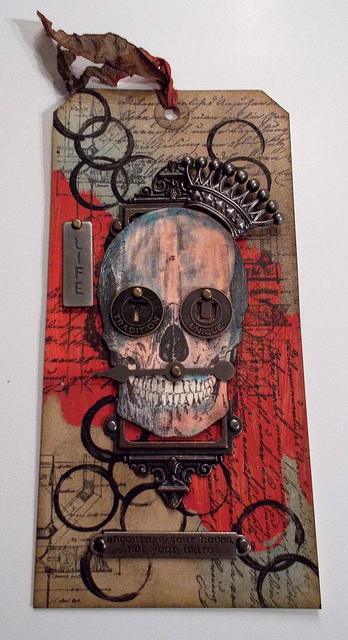 Love the background and how you distressed mr skull. And oh the use of idea-ology is brilliant as always. I'm going completely nuts over the new stuff! Good luck on the healthy eating. The tag is wonderful. Love the mustache you created rather than the one that seems to be all the rage these days from mustache door mats to mugs. I feel your "pain" regarding eating better. Like you, I know what is needed but there is not an anorexic molecule in my body, so it is hard to live, eat, and breathe "better energy sources for my body." Good luck, and it was great to read your post this morning. 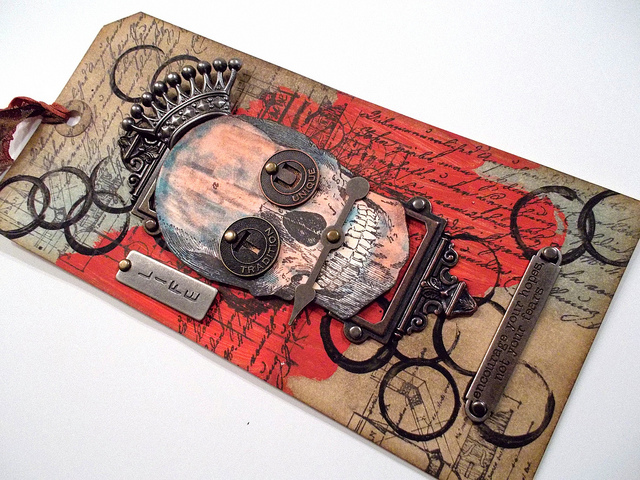 Fab tag.... it's fun and scary all at the same time! I think it's the tokens on the eyes that spook me out...lol. Is the red on your background paint or ink? Good luck on the no coffee... you don't have to go cold-turkey on it to be healthier. Maybe just allow yourself coffee in the morning until 10am. And tuna! Don't eat it if you don't like it... there is so much better healthy food than that! haha or that is at least what my Weight Watcher leader says! LOL If it were easy, then everyone would be a skinny minny and run marathons every day. Apparently an apple is better at waking you up than any caffeine (so the scientists say). I've been having one since I had my second boy (3years) cause coffee was not my friend and it seem s to work! Keep up the good work. Loving the Tag! Of course they always give me inspiration to do something FUN! I'm still finding ways to adjust for my heart's sake. I just enjoy experimenting around & you will find all kinds of things to add to your menu that is scrumptious & it is okay to have a fried chicken now and again...bock bock! Awesome! That skull is so cool! Love all the fun details. I drink tea all day long! I decided that no matter what...I am having my morning cup of tea. I drink it black, without sugar or cream...and it makes me a kinder, gentler person. So, maybe let yourself have just that one cup of black coffee in the AM...and avoid the evil caffeine withdrawal headache. I've been doing a 4 day cleansing fast...and yes, it is as gruesome as it sounds. But, after day 3, I'm down 6 pounds....and that is a good thing. So, we'll see how the scale treats me tomorrow. I love all your use of circles on this tag...and the background is great. You are never alone in the 'new eating lifestyle' arena! I'm there, too...so good luck to us. Wean off the coffee, go to decaf...you'll be fine! Your tag is awesome! skeeery but a little cute at the same time! I like him! The tag is fabulous. Love all the elements. As for your diet, don't deny yourself the coffee. LIMIT yourself on the coffee. You should only have 2-3 cups (and not the 32 or 64 oz cups) and you should then switch to water. You shouldn't have any caffeine after noon so you can sleep well at night. I do the Atkins diet and it helps me. They say I can have the 2-3 cups in the morning, but water after that. I lost 65 lbs. doing it and I can say it really works. My good and bad cholesterol finally is where it's supposed to be and my body fat has gone from 35% down to 16%. Remember to exercise, exercise, exercise. Put a treadmill in the craft room. Make it run something so if you want to use the computer, you have to walk on the treadmill. Good luck! Keep us posted as to your successes (and failures) so we can give you Attaboys! What a very interesting tag Jim. Awesome in fact! I do not understand why you have to give up coffee unless you are loading it up with sugar and cream. There are some things in life that we have to keep when we make a food lifestyle change. For me that would be my coffee. I drink one cup in the morning with Agave Nectar for sweetener and just enough half and half to give it a nice color. Regardless I wish you well on you journey. Have fun at CHA.........I know Anaheim well, as I lived in Orange County for years. Love the juxtaposition of the word "Life" with the skull. That is one seriously disturbing tag but I love it! Don't give up the coffee. Buy a Keurig - the cost of the darned K cups will make you cut back, and then just drop the sugar or use Splenda, and only use enough creamer to take the bitter edge off of it. I'm down to 2 cups a day and 1 Chai Latte. I do love your tag, especially the tokens--one for tradition, one for unique. Like opposite sides of life, the yin and yang of it. Hey! In the spirit of solidarity and support of your healthy eating initiative, maybe we could all join in a "Crafter's Challenge" for healthy living. Too many hours of sitting around playing with stamps and ink and paint can broaden more than one's creativity! I'm game. Way cool tag!! Coffee deprived inspiration?!! You create amazing pieces of art! All the best for your lifestyle changes. Can't tell you how much I LOVE the tag. Skulls and anything Halloweeny are my favorites. I can truly sympathize with your diet decisions. Keep up the good work. I think I missed something. Why no coffee? There are zero calories in a cup of coffee. No food and no coffee at the same time??? Isn't that against the Geneva Convention? My husband is a "big" guy. He lost 79 pounds over about 8 months by just walking 4 miles a day. He drank lots of water....lots of water .... and watched his portions. He knew he couldn't "diet". Tried so many times. It worked and he's kept it off. When he starts to gain he just makes sure he's drinking his water and taking his walks. He drinks pots of coffee a day by the way. Hope this helps. Diets just seem to hurt our bodies. Just a few healthy changes at a time. Jim this tag is amazing. I also like the black circles for interest, fantastic as usual!!!!! Jim, you are HI-LA-RI-OUS!!! LOL!!! Love your stories and your tag looks so cool. Good luck with your new eating lifestyle! ;) I too am trying a healthier lifestyle...WE CAN DO IT! Jim, now that I have been following you for almost a year, I can say that you are definitely not the healthiest eater out there!!!!!!! So I am very glad to hear that you are trying to turn that around. Like most, I love you to death dear friend and would like to think that you will be with us for a very long time. So keep up the good work. It isn't that you can't eat your favorite foods so much as it must be done in moderation. To much of anything is not healthy!!! Balancing all of the food groups is also really important. Small meals several times a day is the key and making sure that you are consuming small portions from all the food groups, as well as exercising. You can do it Jim, even if it means taking a break daily just to clear your head with a good brisk walk. As you walk, you can dream up all those wonderful creative ideas for upcoming projects. Kill two birds with one stone. Have a great trip Jim, enjoy and take lot's of pictures. We can't wait to see what this years CHA has to offer. Wow! That is soooo cool! I love it! !